Thinner tread also lowers rolling resistance while the tyre is maintaining ideal shock absorption properties and high puncture resistance. How Does the Tubular Clincher Tyre Work? When inflated, the tubular clincher (see image below), in the same way as a tubular, is pressed towards the rim. Simultaneously, the bead blocks of the profiled rubber band spread out embedding on the rim shoulders and eliminating any rotation of the tubular clincher against the rim as well as the possibility of the tubular clincher unseating. As the tubular clincher is inflated, the band side literally 'bite' into the rim shoulders. 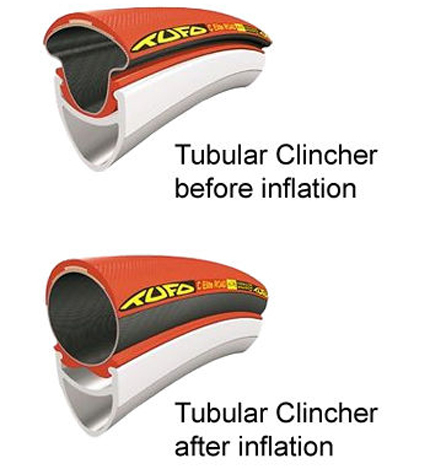 Benefits of Tufo's tubular clincher tyres: high inflation pressures - up to 15 bars (220 psi) without any damage to the rim walls, even in a case when the rim manufacturer specifies lower inflation pressures (the pressure is contained inside the tubular clincher and does not affect the rim wall), same riding quality as with tubular tyres, safe handling in case of punctures (the stability of a rider is not affected), the tubular clincher can be ridden when flat, and the fastest and easiest installation and dismantling without any tools.